America Recycles Day, a program of Keep America Beautiful, is a nationally recognized day dedicated to promoting and celebrating recycling in the United States. 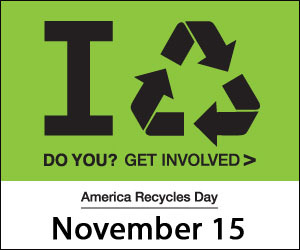 Every year on or around November 15 (America Recycles Day) event organizers like you, educate neighbors, friends and colleagues through thousands of events. Want to organize an event? Find out more here.